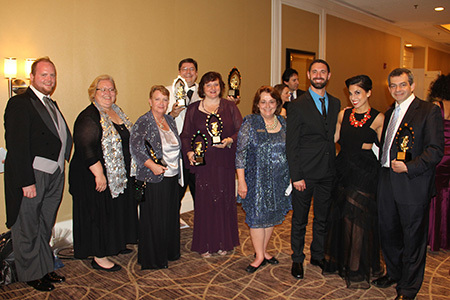 From left, the cast and crew of Maurer Productions' "Around the World in 80 Days," which was nominated in eight categories and won two Perry Awards: Anthony Remer, Emily Russoniello, Judi Parrish, John Maurer, Diana Gilman Maurer, Jane Coult, Dan Keyser, Maria Aromando and Kurt Penney. The Pennington Players' "The Diary of Anne Frank" garnered multiple nominations and wins for youth actors Isabel Kinney as Anne and Evan Braasch as Peter Van Daan. They are pictured with the show's director Judi Parrish. West Windsor, N.J. – The top honors for community theater productions in New Jersey are handed out each fall at the New Jersey Association of Community Theaters (NJACT) Perry Awards ceremony. The organization gave Mercer County Community College’s (MCCC’s) Kelsey Theatre a big, warm hug at its September 18 event. Kelsey award winners included: Isabel Kinney for Outstanding Youth Actress in a Play for “The Diary of Anne Frank,” presented by the Pennington Players; Evan Braasch for Outstanding Youth Actor in a Play for “The Diary of Anne Frank,” presented by the Pennington Players; Diana Gilman Maurer and John M. Maurer for Outstanding Properties for a Play for “Around the World in 80 Days,” presented by Maurer Productions OnStage; Jamie McMillin for Outstanding Supporting Actress in a Musical for “The Addams Family,” presented by Playful Theatre Productions; Shannen Doyle for Outstanding Lead Actress in a Musical for “The Addams Family,” presented by Playful Theatre Productions; and Kurt Penney for Outstanding Supporting Actor in a Play for “Around the World in 80 Days,” presented by Maurer Productions OnStage. 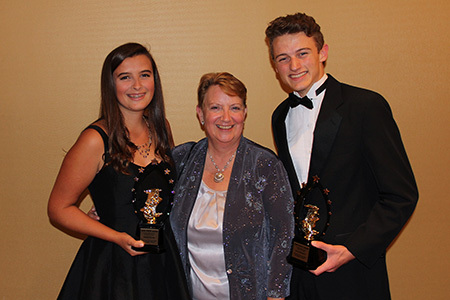 Getlik notes that the awards received by Kelsey companies recognize every area of theater excellence: actors both young and adult, production quality, and genres including musicals, dramas and comedy. “We have incredibly talented people working very hard to deliver the shows presented on our stage. The theater’s quality is reflected in our numbers. Close to 40,000 theater-goers attended our shows last year, some of whom are local and others who traveled here from other parts of New Jersey and from Pennsylvania. Our partnership with these companies is very dear to us and we are glad they have been recognized for what they do,” she said. Each year approximately 200 shows around the state receive roughly 400 reviews by NJACT volunteers to determine those most deserving of recognition in more than 30 categories.